A silicon catheter covered in the biofilm after 20 days exposure. New research could lead to new treatments to prevent blockages and urinary tract infections experienced by many long-term catheter users. 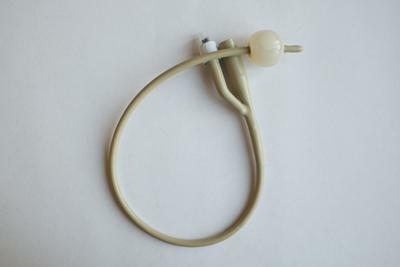 Up to 50 per cent of long-term catheter users experience encrustations and subsequent blockage, which result in severe trauma and pain for the individual and place high burdens on healthcare services and finances. 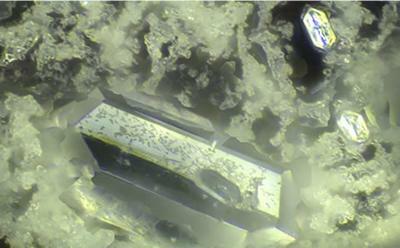 Using an imaging technique called episcopic differential interference contrast (EDIC) microscopy, researchers from the University of Southampton identified four clear stages to the development of a crystalline biofilm, which leads to encrustations. The research also provided new insights into the role of the Proteus mirabilis (P. mirabilis) bacterium that causes the biofilm to form. The Southampton team used EDIC microscopy to study the development of the crystalline biofilm over a 24-day period on two common catheter materials - silicone and hydrogel latex. They found four distinct stages: (1) an initial foundation layer formed by individual ‘colonising’ P. mirabilis cells, which occurred in less than one hour; (2) this was rapidly followed by a sheet-like microcrystalline material that covers this conditioning film from which; (3) after 24-hour exposure, large amounts of crystalline material extends out and; (4) within four days the entire surface (of both catheter materials) was covered with a crystalline biofilm, in which P. mirabilis was embedded throughout this structure. The results showed that the biofilm occured equally on silicone and hydrogel latex and that the two materials had no effect on the time progression of development. The study is being presented at the official launch of the University’s Network on Antimicrobial Resistance and Infection Prevention (NAMRIP) today (14 December). Professor Dame Sally Davies, the Chief Medical Officer for England, will be the keynote speaker at the event, which will highlight the University’s world-class interdisciplinary research to address the global challenge of Antimicrobial resistance. Professor Dame Sally Davies said: "This new research into developing innovative technology is pivotal - so we can reduce the amount of antibiotics we prescribe. If effective solutions are found, which will prevent antibiotics being needed in the first place, we can help to preserve these precious medicines. "The overuse of antibiotics is a global issue, and we must all play our part to drive forward action if we are to save modern medicine as we know it." The new findings, published in the journal PLoS ONE, challenge traditional theories and previous findings and add further important information. Dr Wilks added: “The use of EDIC microscopy provides a rapid and effective method for visualising crystalline biofilm development directly on catheters, offering considerable improvement over previous imaging techniques. The study, in collaboration with Health Sciences, was funded by a Knowledge Mobilisation Fellowship in Healthcare Technologies from the University’s Institute for Life Sciences, a leader in life sciences research, development and innovation.